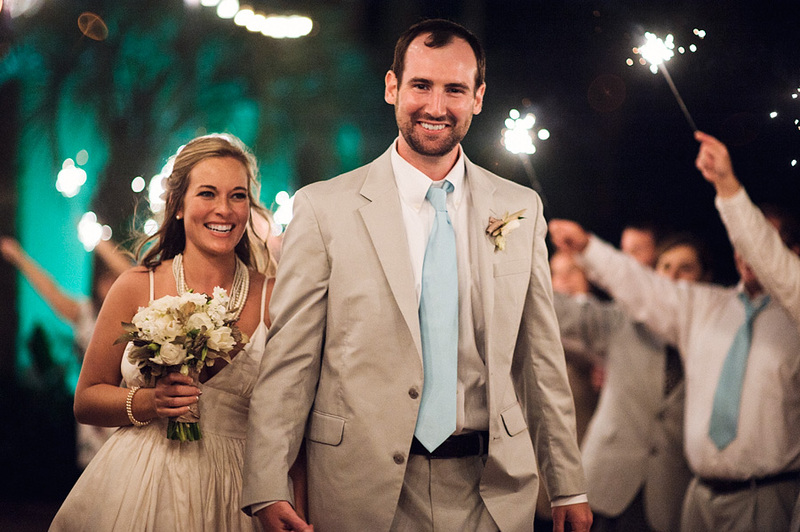 This darling couple certainly had their fair share of “wedding obstacles” to overcome, but the end result was just perfect! 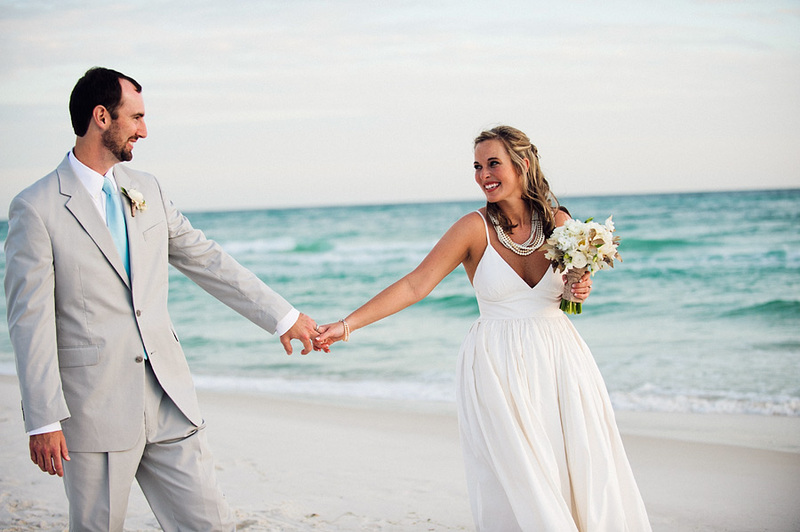 Jenna and Joseph married at our famous beach walkover (# 7 of course!) 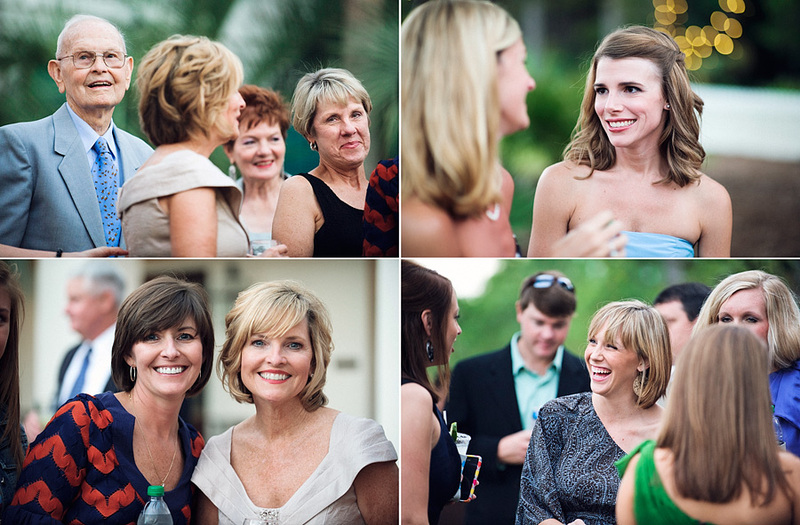 and entertained their guests for the reception on the Village Green. 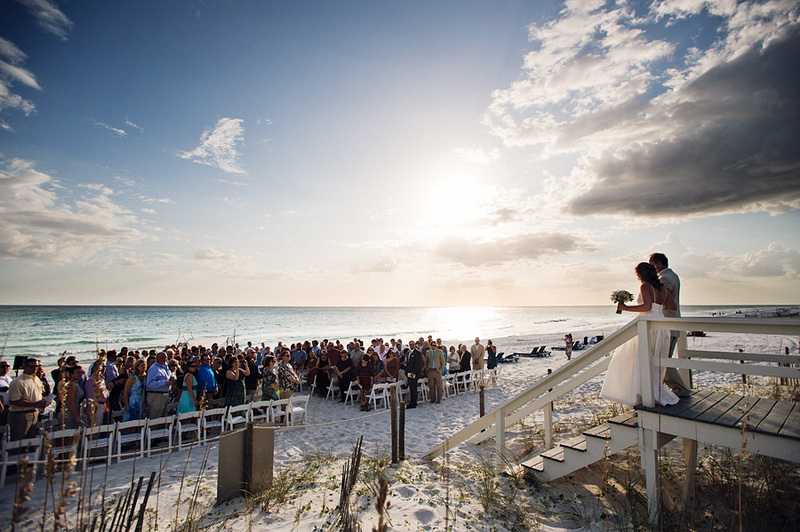 Originally, we were hired as their planners in Seagrove, but their venue fell through and Carillon Beach was the perfect replacement. 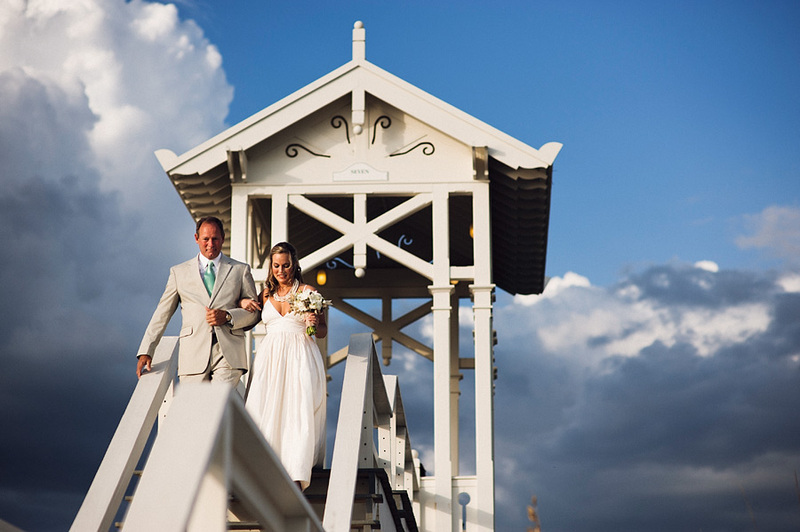 The weather couldn’t have been more ideal, with the clouds making a gorgeous background for photos. 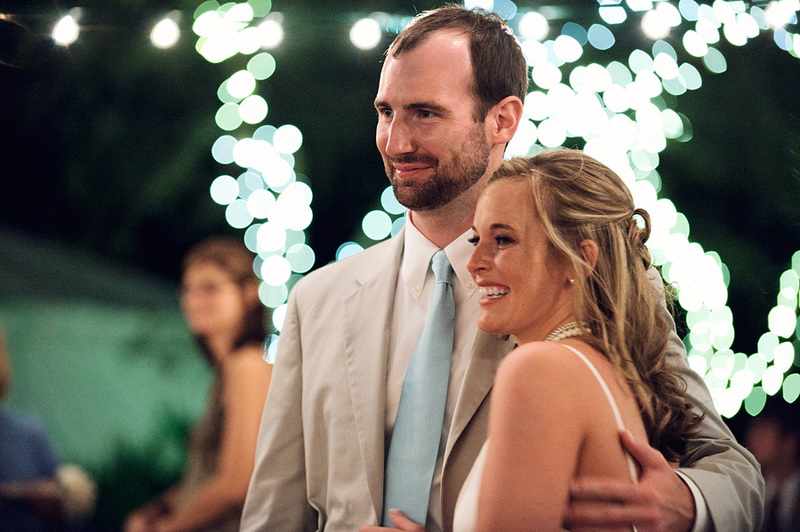 Nouveau, the event designer, captured Jenna and Joseph’s personality to the T! We loved the fabric draping attached to the twigs for their ceremony, and the subtle pattern added that extra “oomph” and texture! 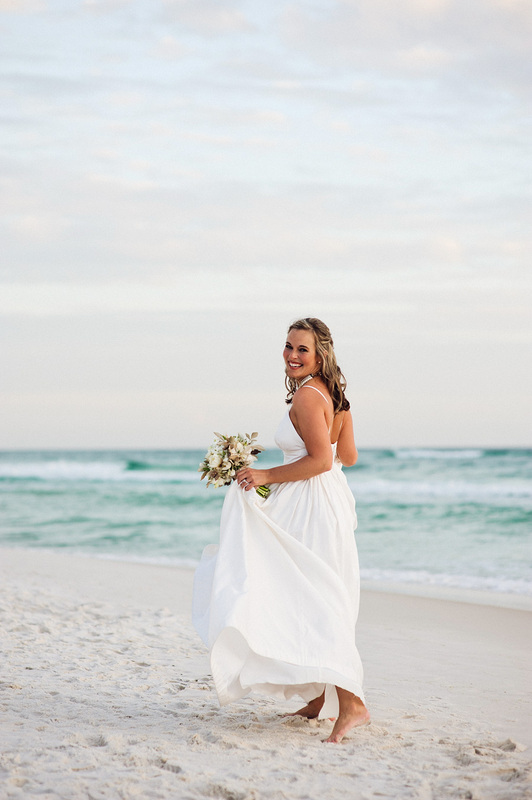 Jenna was absolutely stunning! 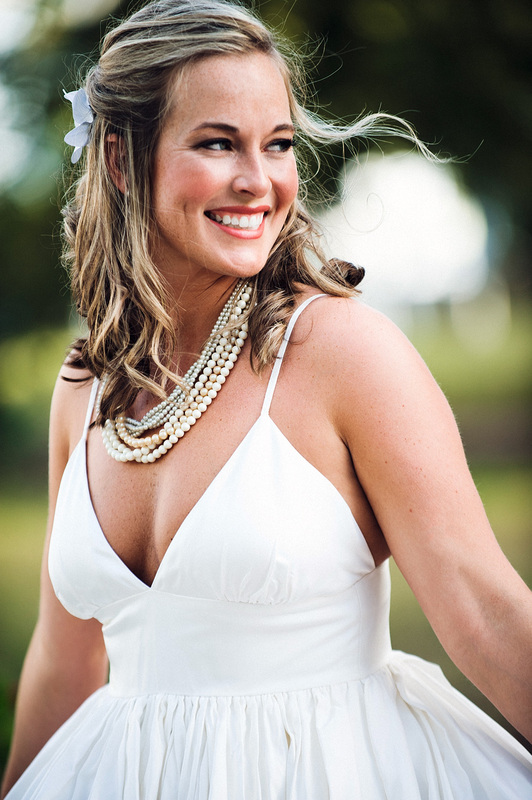 Her layered pearl necklaces were the ideal accessory for her destination J.Crew wedding dress! 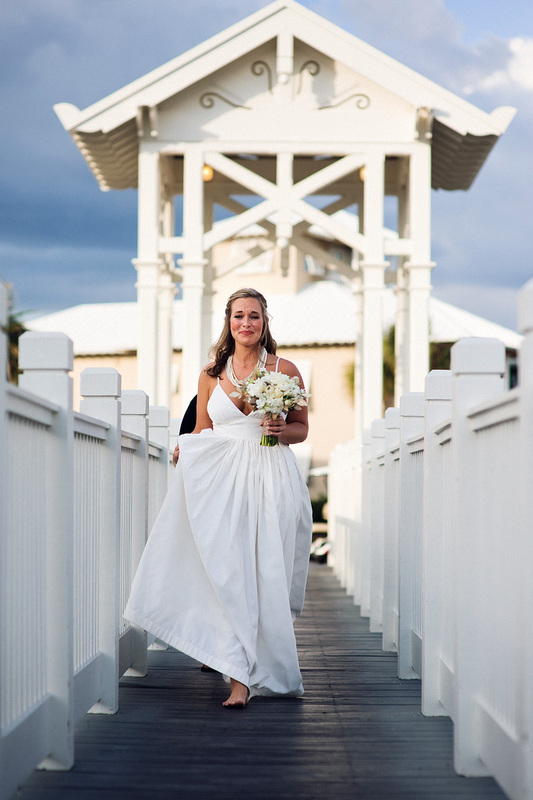 Paul Johnson Photography was able to capture this incredible moment just as she ascends the aisle with her dad. Needless to say, it took a little more effort and climbing in the brush to get this beautiful picture! 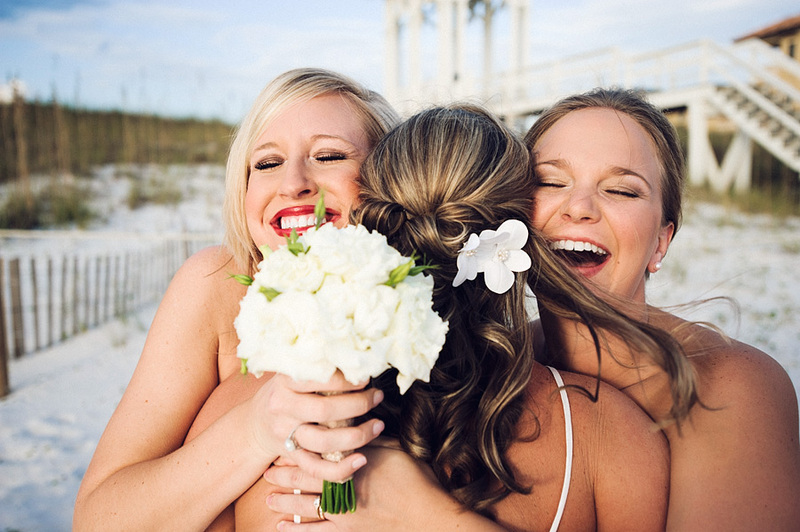 There’s nothing like a little quality time with your best friends on the happiest day of your life! 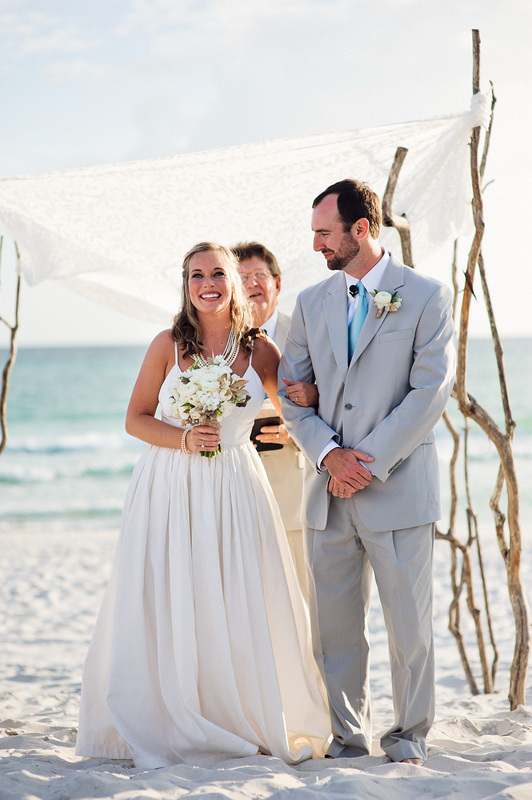 Their fun personalities were definitely shown in these pictures! 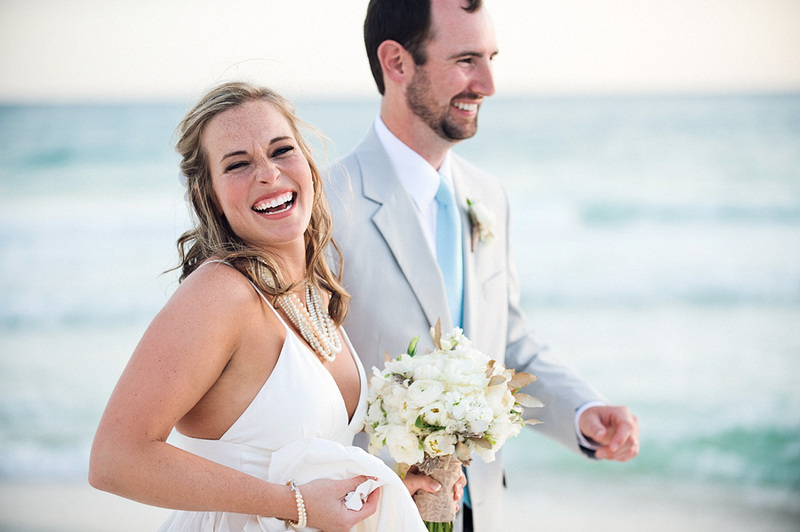 Those pearly white smiles are all you need to see how much these two love each other! 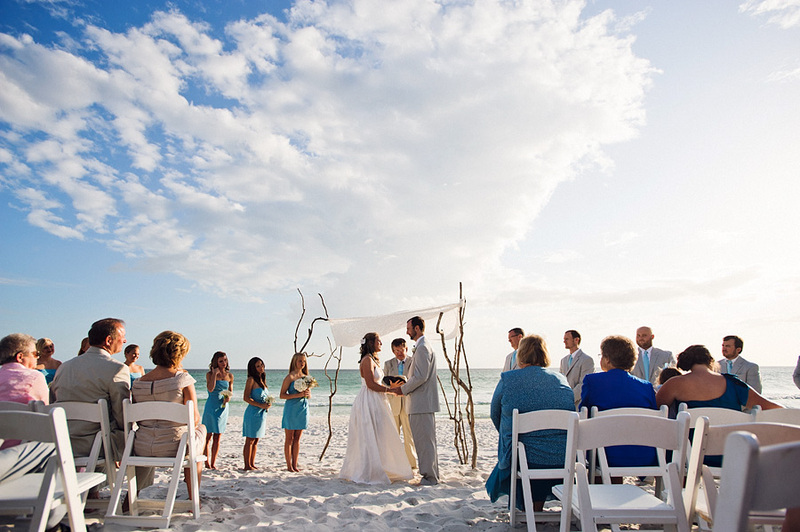 And on to the reception! 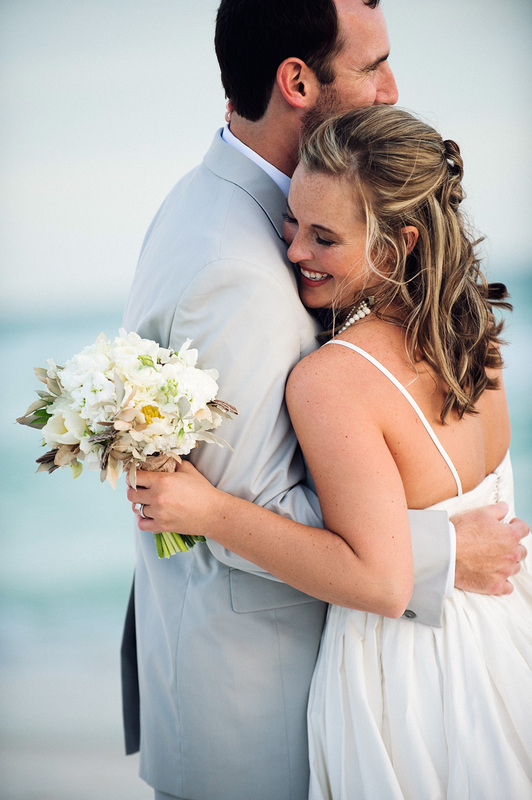 Spending valuable time with their family and friends was something that was very special to this couple. You can truly see how much these two are loved. The cafe lights lining the wooden dance floor were subtly glowing throughout the night. The lounges made the perfect spot for a quick dancing break! 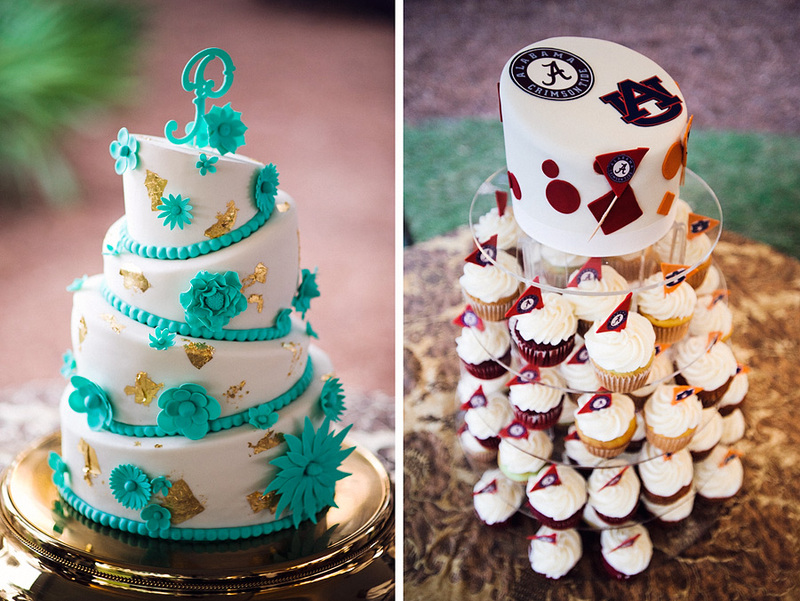 Confections on the Coast made her a fun, topsy-turvy bridal cake! And of course you can’t have a grooms cake without it being decked out in sports! 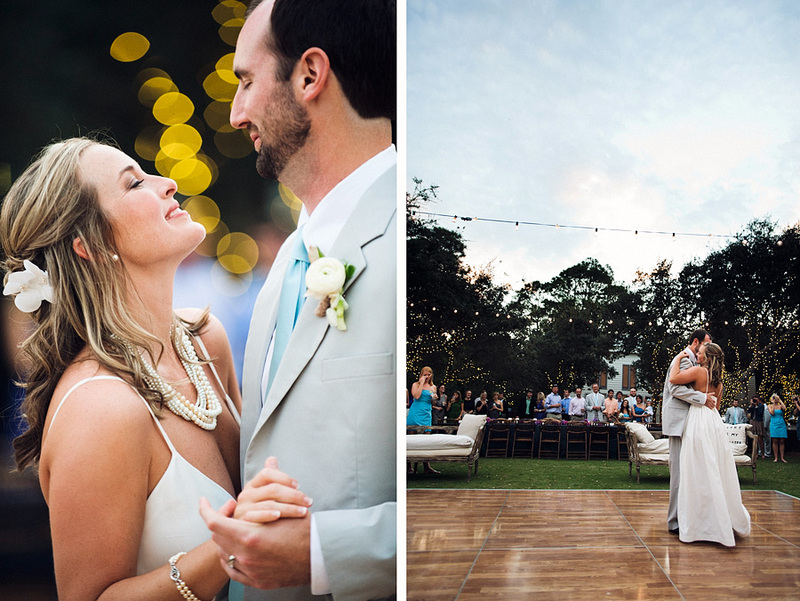 Their family is the exact definition of a house divided, with one of the oldest rivalries in the South! 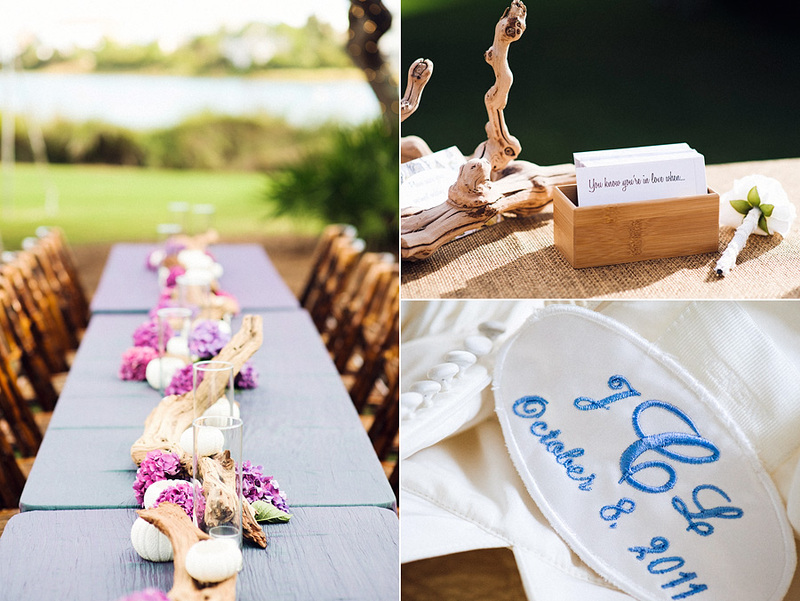 Lilac tablecloths complimented the driftwood and candle tablescapes, giving the decor a coastal feel. 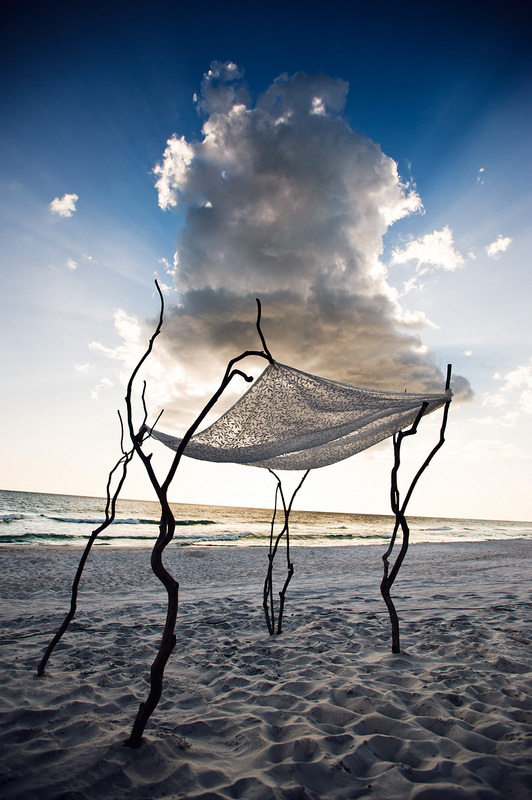 For a personalized touch, her “something blue” was an embroidered patch sewn into her J. Crew wedding dress. 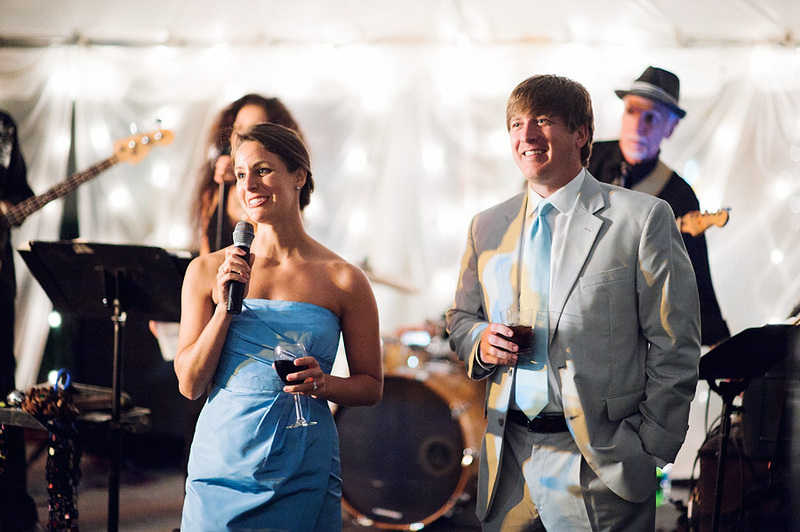 Around cake cutting time, the best man and maid of honor take on the spotlight for their toasts! 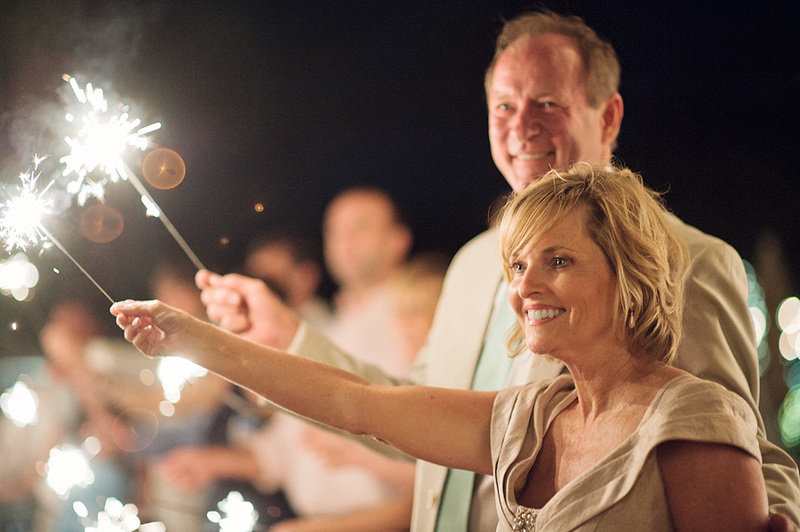 A sparkler send off is always so much fun for the special couple and their guests! 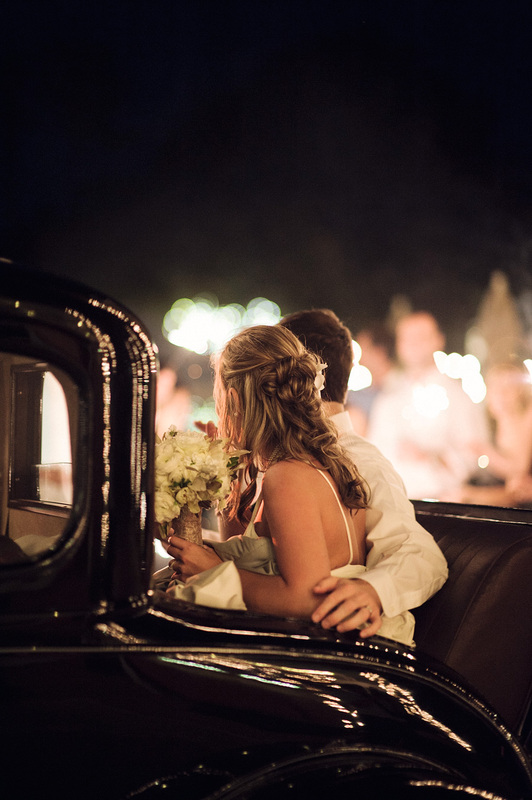 As the night ended, Jenna and Joseph rode off in a vintage 1930 Model A Ford from A Bride’s Ride!